Of the many great partnerships I've formed as a photographer over the last few years, the one I have with GPP is amongst the strongest. I've taught for the last few years at their Dubai events and now we've teamed up to create probably THE COOLEST PHOTO TOUR EVER!!!! oops, caps lock off. 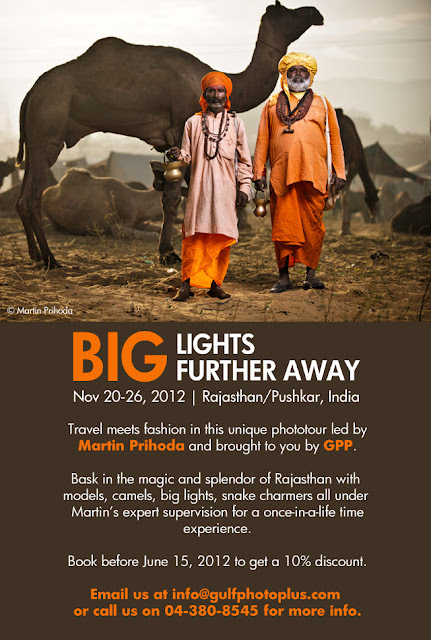 Kidding aside, this coming november I'm leading a tour through Rajasthan which will involve the Big Lights Far Away lighting style I teach and practice. Using large off camera light sources will dramatically shift your photographic style. Learn to use these skills, apply them in remote areas of the world and you have a recipe for amazing, publishable photos. Utilizing these techniques is tricky, though. Balancing light, strobe power, the sun and using complex triggering gear in areas that are remote and often times a bit scary is a skill that takes a while to master. Luckily we've got everything set up for students so they needn't worry about their security but rather just making great images. Click below and check out more on the GPP website! !